Just because a stock is seemingly overlooked doesn't mean it can't be a winner for investors long-term. The stock market is bouncing around near all-time highs, but that doesn't mean all stocks have shared equally in the market's success. Some stocks are overlooked because they're out of favor or in a weak industry, but that doesn't necessarily make them bad investments long-term. It's in the heap of overlooked stocks where investors can find sales on some premium stocks. As I looked for sales on the market, some big names popped out. Given a variety of factors, I don't think the market is giving Verizon Communications Inc. (NYSE:VZ), Target Corporation (NYSE:TGT), and Walt Disney Co (NYSE:DIS) enough credit for their profit and long-term growth potential, and that's why they're my top stocks on sale today. Cell phone service has become a consumer staple in the developed world, and Verizon Communications is a leader in the U.S. with more customers than any other provider. The company was a leader in 4G LTE technology, which is now an industry standard, and if Verizon's buildout goes as planned it will be a leader in next-generation 5G wireless as well. Next-generation 5G could enable a new wave of technologies like self-driving vehicles and smart cities, and it could even replace broadband connections in millions of homes across the country, opening new revenue streams for Verizon in people's homes. Verizon's leadership in wireless telecommunications has led to steadily growing revenue and enough free cash flow to fund a growing dividend that now yields 5% at today's stock price. 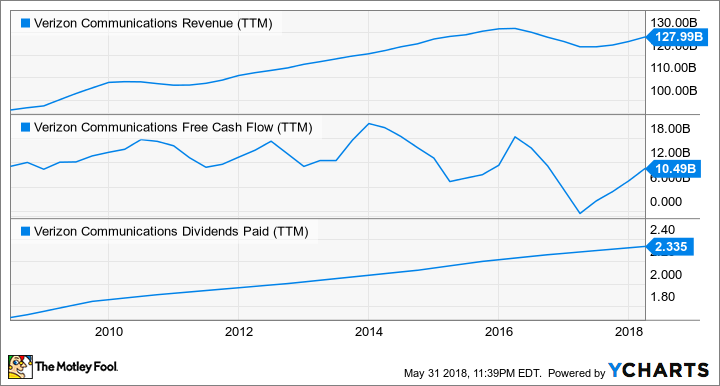 Free cash flow isn't steady every quarter and will fluctuate as Verizon invests in new capabilities, like its 5G network, but long-term the company has proven the ability to generate around $10 billion in annual free cash flow. As 5G networks are rolled out and Verizon upgrades customers to premium services and more connections, revenue and cash flow generation should grow from their current levels. I like that Verizon serves a modern day consumer staple, providing a stable foundation on which it can build a next-generation wireless network that will fuel growth. With that backdrop, I think Verizon's stock is on sale due to its high dividend yield and the stock's price-to-earnings ratio of just 10.5 times 2018 earnings estimates, which is a great value in today's market. The next stock on sale is Target, a retailer that hasn't gotten much love from a market that prefers high-growth companies like Amazon or Shopify. Target has had its struggles adapting to e-commerce and fewer brick-and-mortar shoppers, but I like Target's stock because I think the company has finally found a niche it can comfortably grow into. Target has expanded its high-quality differentiated retail offerings with lines like Champion, Harry's, and Bevel while adding exclusive brands like Universal Thread, A New Day, and JoyLab. It can provide customers with the prices of a big box retailer with a little bit of a high-end feel, which is unique in the market today. Shipt worker fills Target cart with groceries. Image source: Target. Where Target has had to play catch-up to competitors like Walmart and Amazon is online. Target hasn't had success head-to-head with its bigger online rivals, but it's now found what I think is a winning strategy, using its store infrastructure to its advantage. Deals app Cartwheel is a successful coupon application, same-day shipping from stores was added with recent acquisition Shipt, and Target Restock provides a recurring revenue service to add value to its regular customers who may be moving some of their shopping online. Those apps are great improvements to Target's services, but the game-changer might be Drive Up, which allows customers to order online and drive up to a front-row parking spot at a Target store, where a worker brings the goods you've ordered and will even load them in your car. If you're in a hurry or have kids in the car, that's an incredibly valuable service and may be more valuable than two-day shipping from competitors. Target's shares are trading at 14.3 times estimated fiscal 2019 earnings, and investors are getting a 3.5% dividend yield as well. If concepts like Drive Up, Shipt, or Restock catch on, this could be a top-performing retail concept long-term. Disney is under a lot of pressure from investors and analysts to turn around the declines in ESPN subscribers. The sports media network has long been the leader of the media networks division, which generated $12.4 billion in revenue and $3.3 billion in operating income in the first half of fiscal 2018. What's concerning for investors is that media network revenue only rose 2% in that time frame versus a year ago, and operating income was down 9%. If ESPN is in trouble, many investors worry that cable networks could fall with it. I think investors may be overlooking that Disney is a leader in media content from the big screen to living rooms around the world. It has some of the best movie studios in Marvel, Pixar, and Lucasfilm, and it owns ABC and its affiliate studios and networks. Those assets will create a base for three streaming services, starting with ESPN Plus later this year. Long-term, Disney will likely replace cable subscriptions with streaming subscriptions that customers will access directly through Disney. Content is a huge differentiator for Disney, especially if you look at how it has outperformed media competitors over the last two decades then look at Disney's revenue from theme parks. Disney leverages its media assets to build rides and experiences that attract consumers to its theme parks, which have generated $10.0 billion in revenue, or one-third of all revenue, and $2.3 billion of operating income in the first half of 2018. Disney's shares aren't as cheap as Verizon or Target at 14.6 times 2018 estimates, but the company has great growth prospects with the launch of its streaming service and media assets that will endure for decades to come. If you're shopping Wall Street's discount aisles, Verizon, Target, and Disney are a great place to start for value, dividends, and businesses that are built to last.